The Indian Navy is sifting through proposals sent by salvagers from around the world on retrieving sunk submarine INS Sindhurakshak and firmly establishing what led to the August 14 explosions that killed 18 personnel. This kind of complex salvage task has never been undertaken in the country. Five companies – Titan Salvage, Smit, Ocean Centre Diving, Arihant Divers, Graph Tech Marine and Duke Offshore – have submitted their proposals on how the boat can be salvaged. After going through the proposals, the Navy will invite bids as the next step in selecting the most suitable entity to carry out the challenging task. 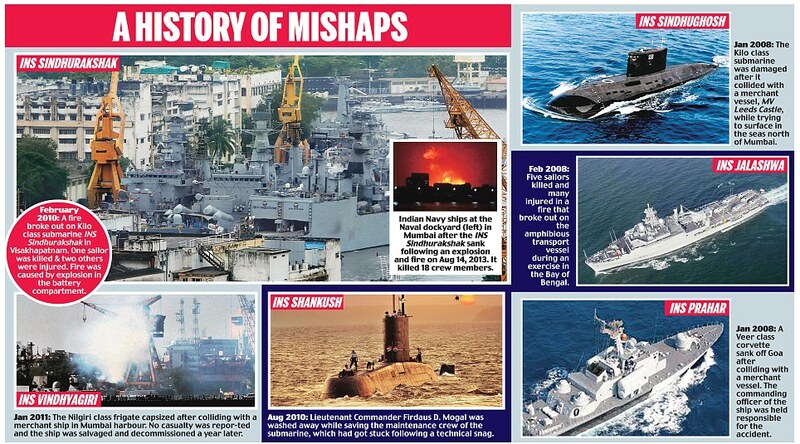 Very few navies in the world have the capability to carry out salvage operations of this kind. Sources described the daunting task that awaits as an “enormous challenge” as the submarine is around 10-15 per cent submerged in the seabed. Making matters worse is that it has sunk in an area of restricted space at Mumbai’s naval dockyard. Far from being a positive, the limited depth in the dockyard restricts the options for any salvage operation. Simply lifting out the vessel isn’t a bright idea either. The structural integrity of the submarine is still not 100 per cent established to ascertain if it would be able to withstand the lifting.